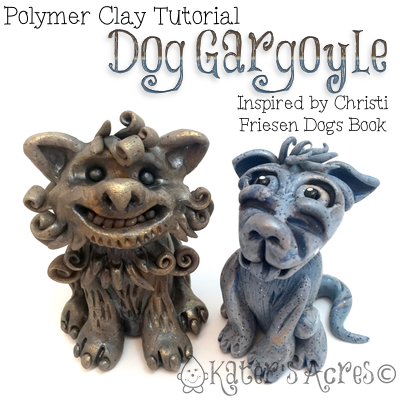 Fun, free, & fabulous this polymer clay dog gargoyle tutorial is bound to make you bark with the dogs. First, choose your colors and create your own “rock-ish” blend. Portion your clay into sections from largest to smallest: body, head, 4 legs, tail, & ear portions. Using the largest section, roll a teardrop for the body. TIP: I made my dog gargoyle to look like my Mocha Latte, a lab coonhound mix. Her chest is big and bulky with a skinny tummy, so I turned my teardrop so the fat size was UP and the skinny side was down. Follow the instructions in Christi’s “DOGS” book to create the back two paws & legs. Don’t forget to add some toes to your figurine. Use the second largest section and roll another teardrop. Place it on the top of the large teardrop and blend the seams. Add a mouth and a nose. TIP: Noses will vary depending on the breed of dog you are sculpting. Add the tail onto the back and blend the seam. Use a sculpting tool to create sockets for the eyes. Take two pea-sized rounds of clay and insert as eyes. Add facial wrinkles or fur as needed depending on dog breed. Add ears in the size, shape, and style of your particular dog breed. Add the front paws as shown in Christi’s “DOGS” Book and blend the seams. Take a good look at your dog and add any fur, curls (as shown in Christi’s Foo Dog), wrinkles, or other dog-like features. Bake at 275 degrees (if using Premo!) in your dedicated polymer clay oven for 45-60 minutes. Allow to completely cool in oven. Remove and place your new dog gargoyle in a place where he can forever sit and watch over your home. The Friesen Project and all Christi Friesen related teaching, giveaways, etc is done in conjunction with Christi Friesen. All tutorials are retaught here with her expressed permission. Please make sure to read about the project here, and get answers to the most common FAQS here.